I have a new obsession that I didn’t think was possible: coffee. Mind you, I gave up coffee back in 2008 and converted to tea because coffee constantly hurt my stomach, gave me headaches, caused acid reflux and made me run (literally!) to the bathroom shortly after consuming it. I never drank it for the caffeine aspect, but rather the taste. I was fond of fresh-ground beans with soy creamer. Two cups in the morning was my limit and more than plenty for my body. Someone told me a couple months ago about cold brew coffee, which has about 70% less acid than regular coffee. I felt intrigued, but scared at the same time since I hadn’t drank coffee in so long. Finally, I tried some and let me just say, it is out of this world! 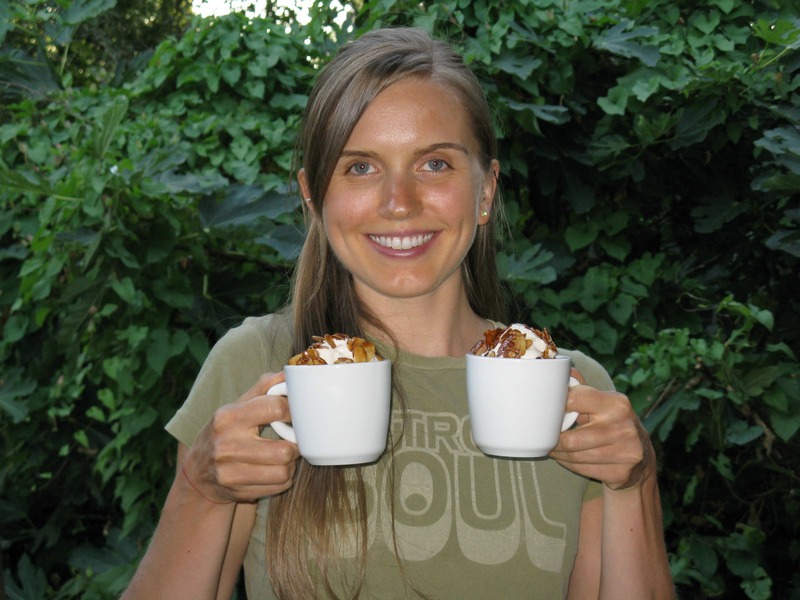 I like to drink it with a bit of full-fat coconut milk and it is heavenly! 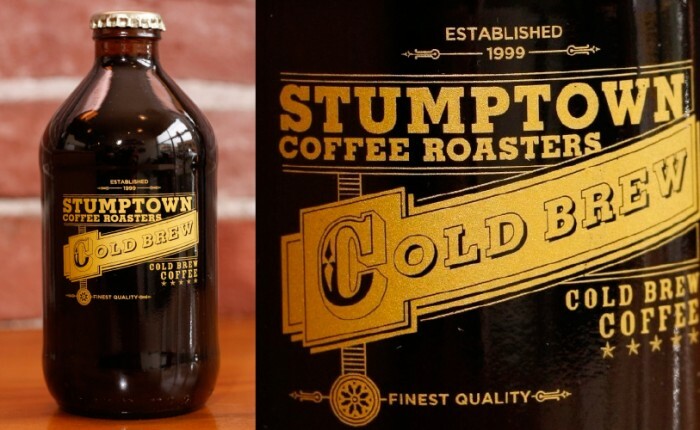 I found the cold brew coffee at Whole Foods, bottled and made by Stumptown Coffee Roasters. Granted, it is not cheap ($3.79 for 12 oz, I believe), so I don’t want to make it a regular habit. I can say that even having one two days in a row is too much for me. Even though it doesn’t bother my stomach like before, the caffeine is still a bit too much for me and my head. Jesse likes the cold brew coffee a lot too, so the other night, I decided to use it to make a special treat — coffee ice cream. It’s dairy-free too! Mix together in a large bowl and pour into your ice cream maker. Let everything process for 20-25 minutes and then empty the ice cream into a storage container, and place in the freezer. Melt the butter, ghee or coconut oil in a skillet over medium heat. Add the almonds, honey and sea salt, and mix together. 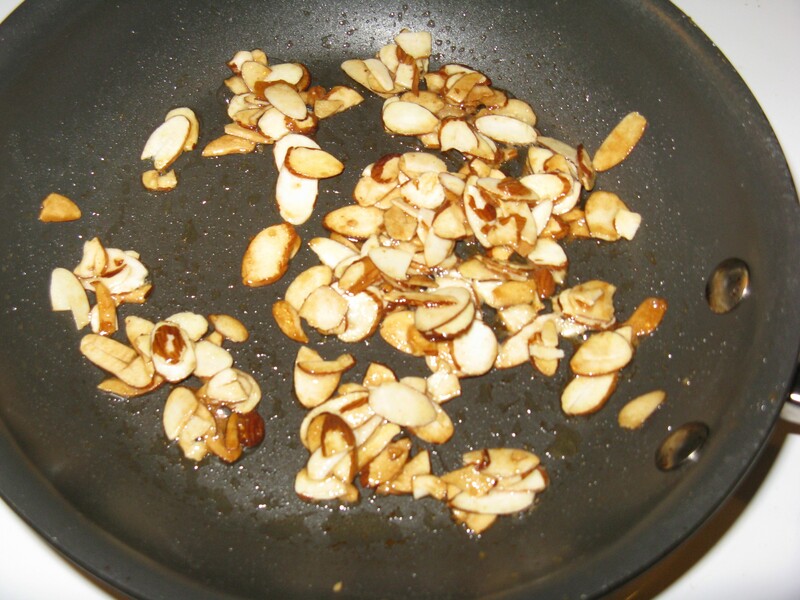 Let the almonds brown over medium heat and stir occasionally, so the nuts don’t burn. Watch closely because it can happen fast, especially if you’re not paying attention. Seriously considering getting an ice cream maker – that looks glorious! Cold brew coffee is gloriously simple to make at home if you’re interested? Trick is to make sure you buy a good quality fresh coffee that hasn’t been dried with too much chemical nastiness. Lavazza seems to suit me pretty well without breaking the bank. Then just make up a cafetiere (they might be called a French press in the States?) as normal, using cold water instead of boiling. I like to make mine up before bed, then leave it to brew overnight. Ice cream makers are definitely handy gadgets to have around and pretty affordable too (I paid around $50 for a Cuisinart on Amazon). Yes, I would be interested in making it at home, especially if it’s as easy as you say. Good quality coffee beans are easy to come by in Portland, as the city is known for its coffee and there are so many different local coffee roasters. I guess I’ll have to buy a French press if I want to make it on my own though. I’ll have to see how much one costs. Thanks for the info! Wow … does that look incredible!!! My tastebuds are doing a happy dance in anticipation! Oh my god that looks and sounds divine! My boyfriend and I used to put chopped walnuts over coffee ice cream, but this looks even better! Your ice cream posts have made me want and ice cream maker so bad, but I can’t really justify any more kitchen appliances right now since I’m still paying off my vitamix! Needless to say, I’m super jealous! Yum! Sounds like you need to invest in a cold brew system. They are pretty cheap. Yes, I’ll have to check into it. It’d definitely be more cost effective, especially over time. Do you make cold brew coffee by chance? You don’t need a system! I make mine in a big mason jar, let it sit overnight and strain it through a fine mesh strainer and cheese cloth in the morning. There’s a recipe on The Pioneer Woman’s site (easy to find!). Her quantity is huge so to break the recipe down, I just match each pint of water to 1oz (by weight) of grounds … I use the french roast from costco (probably not the best coffee but I swear it tastes like chocolate!). Whoa, really? Thanks, Julie … I had no idea! I definitely need to try it out. I appreciate you enlightening me! I need an ice cream maker, that looks devine. I have found that if you do not have an ice cream maker you can put the liquid in a glass baking dish 9×13 or smaller depending on amount of liquid, and place in the freezer then every 30 minutes stir the liquid making sure that it is smooth (untill it gets to firm for this) then after about 3 hours you just leave it be over night! Yes there are some ice crystals in it but it is more like a gelato and my son just loves it! Can you just use hot brewed coffee that’s chilled? Sure, I don’t see why not. You may have to play with the amount though since cold brew is stronger than drip coffee (since it’s a concentrate). I’ll be making my own cold-brew coffee for this, as I make my coffee cold-brew. It’s now all I drink, unless it’s really cold outside and then I use my Keurig. This looks awesome, and with my new ice cream maker, it’s sure to be a winner! If you have a vitamix you don’t need a ice cream maker. just freeze coffee in ice tray and make sure your coconut cream is cold and the vitamix will do the rest. Thanks!!!! I was dying over this recipe, don’t have an ice cream maker, BUT, I do have a Vitamix… I may make this tomorrow…..
How much water is in the coconut milk you use? I usually goldenstar xoxo it milk, which is mostly cream woth about 3TBS of water in it. Otherwise, most canned coconut milk I have found is mostly water and quite grainy. Also, how much does this recipe make? I have 1.5 quart ice cream maker. At the time I made this recipe, I used the Natural Value brand coconut milk, which has no gums, carrageenan, etc. It’s 17-19% coconut cream, according to the can. Other brands I like (that are also gum and carrageenan-free) are Aroy-D (comes in a box) an Native Forest (simple variety). I do not know their ratio of coconut cream to water though. Aroy-D also makes a boxed coconut cream, which works great for ice cream. I agree that graininess does happen sometimes with coconut milk ice cream, but at the time I made this recipe, it actually came out really smooth. It’s possible Natural Value has changed their ratios over the years, but I don’t truly know. I’ve made many other ice creams since this time and would actually recommend whisking all the ingredients together (or blending) until smooth and then pouring it into your ice cream maker. I’m sure the brand of coconut milk you use will work great since it’s mostly coconut cream, but I can’t speak from experience. Like you, I also have a 1.5 quart ice cream maker and it was just right. This makes about 2.5-3 cups of ice cream. Hope it turns out well for you!